Le Monstre is back and more powerful than ever. The D3 Group has prepared a special 2012 Cadillac CTS-V Coupe for the Toyo Tire U.S.A. booth at the 2011 SEMA Show. The car, dubbed "Le Monstre," pays tribute to the 1950 Cadillac Coupe Series 61 that ran in the 24 Hours of LeMans. The classic which bore the same nickname is makring its 61st anniversary of its participation in said race. What sets this CTS-V Coupe apart from any ordinary Cadillac is its output, seriously boosted up from the coupe&apos;s original 546hp 6.2-liter LSA V8. New output is measured at 1,001hp and 1,001 lb-ft of torque, thanks to upgraded internals and a displaced enlarged to 7.0-liters. This is certainly a Cadillac like no other. D3&apos;s competition-spec suspension package and wide-body kit were also equipped to the Caddy, giving it a better ride and style than its standard predecessor. The project sits on a set of new blacked-out 20-inch wheels. 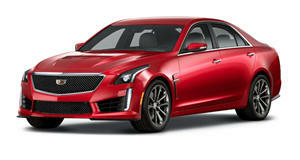 The "Le Monstre" Cadillac CTS-V Coupe will make its debut this week at the 2011 SEMA Show in Las Vegas.